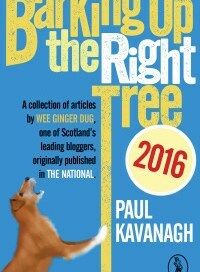 Paul Kavanagh, better known as Wee Ginger Dug, is Scotland's leading pro-independence political commentator, with his passionate blog posts and contributions to iScot Magazine and The National, regularly biting the hand of Project Fear. Come and join the conversation, as he comments on the current political scene and gives his view of where the future lies. Ginger (the real-life version) will, of course, be accompanying Paul and is looking forward to another opportunity to meet his adoring public. There will also be an opportunity for you to purchase signed copies of Paul's 'Collected Yaps' and 'Barking Up the Right Tree' compilations. Admission to the event is free, though donations at the door are welcomed.